The above poem is one of many that affirms the strength and purpose of Mohamed Latiff’s involvement in the literary scene. 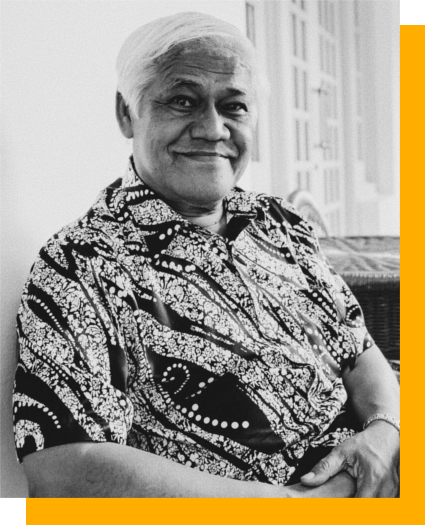 For him, poetry is a means to fight against discrimination and for the Malay community’s rights. “Deklarasi” is a rallying cry that calls upon members of the Malay society to express their voices through the written word, challenging the “wall of discrimination”. The poem ridicules those who do not speak out as “cowardly, selfish” people who are not, in fact, part of Malay society. In this way, Mohamed Latiff acknowledges the importance of language and intellectual discourse as a means to liberate the next generation. The poem captures the conditions of the Malays living in Geylang Serai at the time, bringing to life its dirty roads and poor drainage. Despite this situation, however, the Malays, “we,” never lose hope, and continue to pray, dream, and count stars. di kiri duri di kanan api. Kulihat pipimu rambutmu. Pipimu susumu. I see your cheek your hair. Your cheek your breasts. Here, Mohamed Latiff’s persona addresses a ‘you’ whose God is speed; this persona “shriek[s]” to be heard, as if drowned out by the noise of progress. The poem ends on questions of yearning and love, placing such emotions in opposition to unrestrained change. It mourns for a seemingly lost version of Singapore, describing the current state of the nation as “a bloodless wound” so successful that it does not know it is hurting. Here, Singapore’s progress has led to moral and environmental degradation. In addition, as a contrast to the persona’s memories in a previous stanza of bus drivers protesting for their rights in Malay, there is no more “bahasa kebangsaan,” suggesting that language itself has become estranged from the land. Instead of having a coherent culture, which in previous stanzas clearly includes the persona’s Chinese neighbour, lanterns, joss, and cheongsams, Singapore has become a flattened-out “cosmopolitan city”. Mohamed Latiff’s yearning for an older time is made surprising by his references to political protest and Chinese culture—clearly, this is not simply nostalgia, and might be more accurately described as a lament against both decadence and depoliticisation. Mohamed Latiff Mohamed’s poems are a sobering reflection on the conditions of modern society and the ordinary people that live in it. He succinctly captures the social imagination and memory of Singaporeans, and presents nuanced and heartfelt social critiques of the Malay community. Through his words, readers are able to understand pertinent social problems which are brought to the forefront, and can then better empathise with the struggles of the marginalised.